Blackjack is one of those games that you simply cannot do without. It’s to the point; there is a clean premise with great opportunity for strategies. 1X2 Gaming has created a pocket-sized version of this timeless casino classic and has delivered it beautifully! This variant of Blackjack uses the more practised multi-deck model. 1X2 Gaming uses 6 decks of the standard 52-deck card – bringing the total number of cards to a full 312! The main aim of the game is no different than most other Blackjack variants out there. It is to have a sum total of as close to 21 as possible without exceeding it. A quick tip, however, is to not only focus on getting as close to the total 21 but simply getting a number higher than the dealer. Because that is all you need to secure a win. Below are some general guidelines and expressions you need to be aware of before you move on to become an expert in this realm. - The cards values’ are pretty straightforward. The cards 2 to 10 have the value indicated on their number reflected. Cards with faces – i.e. Jack, Queen, and King – are worth 10 each. And Ace is the magic card in this game that can be either a 1 or an 11. It is also an essential card for getting Blackjack (more on this below)! - Having a ‘Blackjack’ is when you have reached a total of 21 points with just the initial 2 cards you were dealt. The two cards have to be specific to an Ace Jack/Queen/King. This is the best and highest combination a player can hope for and it is an instant win. - The dealer in this version will ‘stand at a soft 17’. This basically means when the dealer’s sum total reaches 17, they will not pick up further cards. Their 17 is ‘soft’ which means there is a chance it has an Ace in it. - Split: If you’ve received 2 cards of the same value in your initial deal, you can choose to have them split. This means you are playing 2 hands in 1 game, increasing your chances of a getting a better sum total. - Double: This bet, too, needs to be placed immediately after the initial deal. If you feel rather confident about the first 2 cards that you were dealt, you can choose to ‘double’ your bet. You will then only be allowed 1 more card. - Insurance: This is an additional bet that you can place given the exposed card for the dealer is an Ace. If the dealer’s next card is a picture card, you will get twice the bet that you placed. 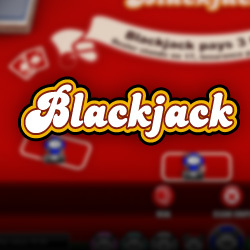 Blackjack by 1X2 Gaming has made an online version of this timeless casino classic. They haven’t deviated from the casino models to the relief of Blackjack lovers. It has a decent betting range and great visuals to go along. Overall, a great pocket-sized Blackjack!